What follows are the words and thoughts about Qi from one of the leading taijiquan masters of the twentieth century, Cheng Man-ching, who is believed by many to be the major influence for the growth of taijiquan (t'ai chi) in the United States. "If the face turns red, his qi rises. If turns white, his qi is chilled. If the eye spirit is focused, his qi is settled. If the eyes are flickering, his qi is floating. If the knees are straight, his qi is old. If qi is old, his body will not be agile. If the body is rocking, his qi is disorder. If the fingers are trembling, his qi is gone." [Cheng Man-ching. The Dao of Taijiquan, p. 252]. This is a beginning of awareness of Qi in Taijiquan. Sink the Qi to the dantian and concentrate it there for softness. Second: The Qi reaches the yongquan, [the "bubbling well," at the center of the balls of the feet]. Here you can "tap into the earth's qi and provide you with rooting strength." Qi rises to the soft spot at the top of the head, the ni-wan (or "clay pill" ). Here you "can receive heaven's qi and thus stimulate your sensitive qi." Master Cheng's New Method of T'ai Chi Self-cultivation, p. 15. "After the qi sinks to the dantian, the xin [heart-mind] acts to dispatch it. Thus sending the qi to the leg, then the knee, then the heel. This is similar to the saying "the authentic person breathes with the heel." Doing the same, send qi to the shoulder, then the elbow, then the wrist. The joints and gates in the four limbs are all open. Thus, going down, the qi can reach the yongquan (bubbling well). Going up, the qi can reach the laogong (heart of the palm), and arrive at the tip of the middle finger. This is what the Boxing Manual describes as, 'With the xin [heart-mind] moving the qi; with the qi mobilizing the body.' In this way, the business gets done!" Zheng Manqing (Cheng Man-ching)/Lee Fife, Distinct Sequence of the Journey. 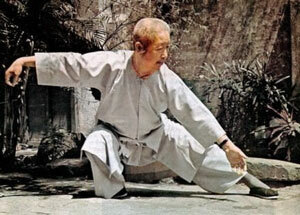 "Every aspect of Professor Cheng's Tai Chi Chuan is to develop the flow and accumulation of one's qi. Concentrating one's qi for the resilience of a small child is his definition of good health, the benefit from which all the benefits of T'ai Chi are gained." Gateway to the Miraculous, p. 124. Further explanations from Professor Cheng's senior students: "Qi is the energy that's around us, the living energy. The internal energy, the energy from the cosmos. The energy coming from the ground. Qi's all around us." "It's so many things, it's like saying what is life? It is life." "Everybody has qi; qi is the life force. It's our breath; it's the energy that runs through us. " "Qi goes beyond anything at this point that science can explain. You can actually feel it." "You feel improved circulation, a tingling that comes from the fingers. When we are free of blockages, the clogs in our veins and nervous system, and our qi runs at a 100% then we heal, then we are healthy. It feels like some energy that bellows up from you and propels you. Ed Young: "So you say Qi is like electricity, okay. So you say Qi is like energy, fine, I'll accept that too. But is it that? I don't know. Could be, but why do you want to know? Does it help your t'ai chi?" "Qi is transcendent energy, the life force. The qi that flows in our bodies is the same qi that moves the stars in the heavens. Qi relates to the circulation of the blood, but also to the energy of thought and spirit." There Are No Secrets, p. 20. "Qi is like light to the darkness of our fear. All you have to do is turn on the light. The power to make miracles resides in understanding that the greatness of our qi, or lack of it, creates the universe." Gateway to the Miraculous, p. 58. No Qi—Do Not Use Qi? Cheng Man-ching writes that these words are "very strange but qi alone is not sufficiently important. In fact this is true." [Distinct Sequence of the Journey.] Translator Lee Fife adds, "I suspect these lines are intended to represent the steps a practitioner takes suggesting that we should develop our qi to get beyond force; at that point, the awareness and intention now needs to focus on the shen [spirit] not on the qi; as we are able to move beyond qi, our non–force becomes even stronger reaching pure hardness." Distinct Sequence of the Journey. Cheng Man-ching further explains the paradox, "If your eyes focus on a place, the shen [spirit/consciousness] will reach that place, and the qi will also follow there. The qi can mobilize the body and you don't need to disturb the xin [mind]. Instead, the shen directs both the qi and the movement. This is shen­-li [spirit power]. It's also called shen-­su (Miraculous Speed). In Physics, with speed, you can multiply your force; and then its effectiveness is without limits. Thus shen­-li also achieves shen­-su." Distinct Sequence of the Journey. At this stage of enlightenment the qi has reached the highest level and is now mental energy and is called spiritual power, or the power without physical force. qi can mobilize the body, but not by mentally willing the qi to move; but rather by the spirit of being consciously aware of carrying the qi with it. This is spiritual power and becomes "divine speed." Cheng Tzu's Thirteen Treatises, p. 80. Elsewhere Professor Cheng continues his explanation saying, the qi of the blood is refined and transformed into essence-qi [jing-qi], which transmutes into spirit [shen] and that—"produces divine strength, pure energy incomparable to ordinary qi. This level exhibits a techniques that approaches the Tao. Never be satisfied with being merely an unbeatable hero." Master Cheng's New Method of T'ai Chi Self-cultivation, p. 22. Closer to the navel than to the spine. The main point is that the qi must be fine, long, quiet, and slow. And gently make them linger there [in the dantian]. Over a long time, this process allows the qi to gradually accumulate. Over days and months, it accumulates; directly cultivating without harm. You cannot measure it; skillfully undertake (the process) naturally (ziran). You must not use even the slightest striving or force. And elsewhere he takes a different approach by writing, "That which is used to provide the great power of a correct T'ai Chi push is not qi but jin, the inner energy…. 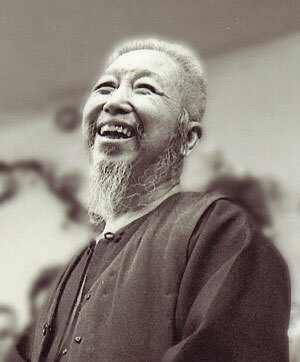 We could say that jin is the way, the tao, of the qi….This is not to say that it is impossible to send forth one's qi. [In a lurid melodramatic kung fu movie a hero] "would stretch out his palm and a wave of laser-like, red energy would stream forth and blow apart a boulder. This image romanticizes a real, very high level [and yet actually even possible] development of qi." Gateway to the Miraculous, pp. 10-11. Editor's Comments: The words given in quotation marks are taken directly from the source cited. Other paraphrased or abridged ideas of Professor Cheng are given with their sources, but without quotation marks. He and those who write about him most often used the older Wade-Giles spellings of ch'i, T'ai Chi Ch'uan and tan tien rather than qi, taijiquan and dantian as are used throughout this entry. One of Cheng Man-ching's translators, Lee Fife wrote "Qi 氣: [is the] "breath or internal energy, the energy that connects matter and awareness. Qi is present within ourselves and also permeates and supports the universe." [from] Distinct Sequence of the Journey: Treatise Eleven of Zhengzi's Thirteen Treatises on Taijiquan, by Zheng Manqing (Cheng Man-ching), translation by Lee Fife. ^ Dantian . "The Field of the Elixir," located in the lower abdomen where qi is gathered and cultivated. ^ Xin – (心 – sounds like "shin"). Heart, mind, intention; located at the center of the chest. ^ Shen – (神). Literally "Spirit," and by extension, "Mental Energy Consciousness." But as in English this term is open-ended with various seemingly contradictory definitions. Others define shen as the source of instincts and behavior; spirit; soul, mind; god, deity; supernatural being." But in the vocabulary of taijiquan the best definition may be "spiritual energy." ^ Jin – (劲/勁). "Refined power." Romanized as "Jin," "Jing," or "Chin." It represents Qi combined with muscular strength. Cheng Man-ch'ing. 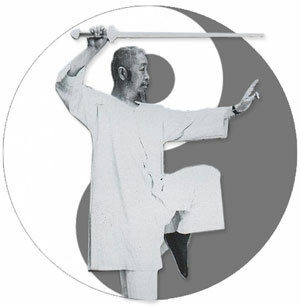 Master Cheng's New Method of Taichi Ch'uan Self-cultivation; translated by Mark Hennessy. Blue Snake/North Atlantic Books, 1999. Cheng Man-ch’ing. Cheng Tzu’s Thirteen Treatises on T’ai Chi Ch’uan. North Atlantic Books, 2008. Cheng Man-ch'ing & Robert W. Smith. T'ai-Chi: The "Supreme Ultimate" Exercise for Health, Sport, and Self-Defense. Charles E. Tuttle, 1992. Wolfe Lowenthal. Gateway to the Miraculous. Frog Ltd./North Atlantic Books, 1994.